With the Paris COP21 talks underway, we’re hearing the phrase “carbon footprint” more and more these days. But what exactly is a carbon footprint? Well, Wikipedia defines it as being “the total sets of greenhouse gas emissions caused by an organization, event, product or individual,” and Merriam Webster as “the amount of greenhouse gases and specifically carbon dioxide emitted by something (as a person’s activities or a product’s manufacture and transport) during a given period.” So basically it’s a measure of how much greenhouse gas emissions can be attributed to each one of us as a result of our daily activities. But “a footprint” is an umbrella term that can be used to refer to other similar measurements — for example, a memory footprint shows how much main memory a computer program uses when running. And this brings me around to something very cool (though a bit unsettling) that I found today and wanted to share with you guys. As a side note, this would probably be a very useful app for a pharaoh. Income inequality and social stratification are hallmarks of today’s economy, both in the context of a single country and on an international level. Even in traditionally rich, developed, industrialized countries where life quality is high and there are plenty of goods to go around, it’s become apparent that the current way of doing things just isn’t sustainable and that too much wealth is held by too few people. But here’s the thing — we see the problems in our society and tend to believe that it’s the same for everyone else, everywhere else. We seldom seem to realize that while the poor (and to some extent the middle class too) in industrialized countries have it rough, in poor countries they go through hell. And that’s what the guys at slaveryfootprint are trying to make us understand. 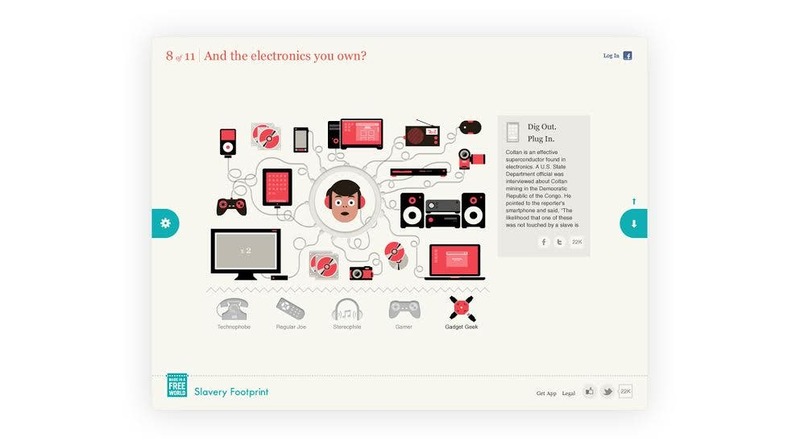 Part of the Made in a Free World project, the website asks deceptively simple questions like what you like to eat, what you like to wear and what kind of sporting goods you own to give you an estimate of how many people work in near (sometimes full blown) slavery conditions for you to be able to sustain your lifestyle. They’re very good at what they do — the first thing you see on the website are two buttons, one taking you to an interactive presentation of the program, and the other to the test itself. Presented in a very clean, well-designed and fluid interface, the questions are really fun to answer and each come with their own uncomfortable fact about slavery in our time. And I have to admit that by the time I got to see my result, that simple-font white number left me chilled to the core. I know it’s a rough estimate (they do have a very well-thought algorithm explained on their page that they use to calculate this number, I just wasn’t very precise with my answers), but any number over 0 that I’d see there would still leave me seriously questioning the system I live in and how my life impacts others. I like to think I’m a good person, I guess we all do that, and slavery (intended or not) is something that tends to take you off Santa’s nice list in a hurry. So go take a look at the website and the intro, then take the test yourself (protip: if you’re not in a hurry you can click on a button to the left after you start the test for a more precise result.) Spread the word, share this article or tell your friends about the website. Tell them to take the test too. If we raise awareness enough, maybe we can break this horrible system and re-make it into something that gives everyone the means for a decent life. All images credits go to the Made in a Free World Project.